Disgusted! 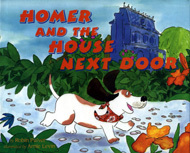 That's how Homer the hound dog feels when his good friend, Ms. Gallivant, moves out of the house next door. Ms. Gallivant was the best biscuit-baking, ball-tossing, back-scratching neighbor he could ever have. Moving is dumb, thinks Homer. Nobody should move. Then, one awful day a FOR SALE sign appears in Homer's own front yard! Homer wreaks havoc to protest the move--but when his mischief backfires, he's left lonelier than ever. Hang in there, Homer, because a dog's life can be full of surprises! -an American Booksellers' "Pick of the Lists"
Out of Print! Contact Robin Pulver directly for copies. I was upset when my husband decided we should move to the house next door, so I decided to write a story about it! In the midst of my work on this story, our family acquired a dog from the Humane Society. We named her Daisy. She was a grown-up dog with lots of problems, and her adjustment, as well as ours, was difficult. For dogs like Homer and Daisy, and for people too, it can be scary to leave one home and move to another.